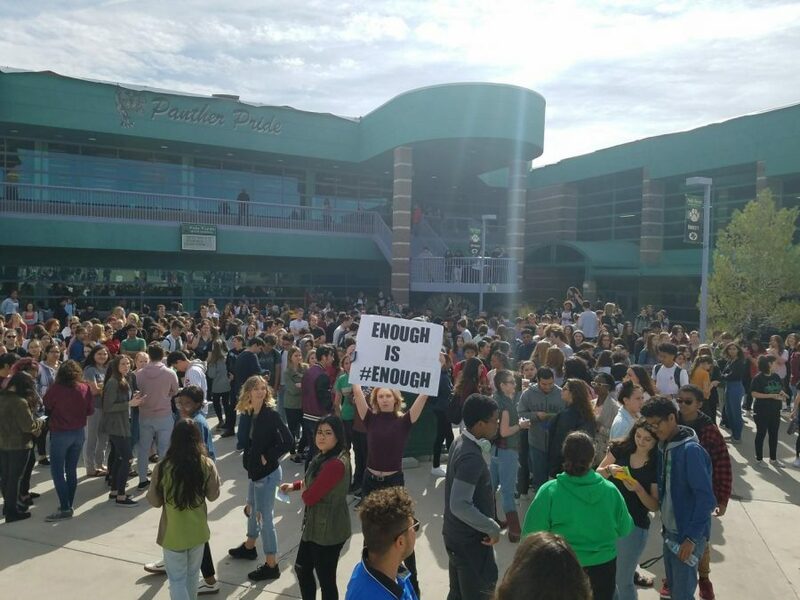 Since the recent school shooting in Florida, students across the nation have been organizing walkouts in protest of the gun violence in America, and CCSD is not happy about it. An article from the Las Vegas Review Journal published on Feb. 20th stated that CCSD does not want students to protest or walkout and encouraged teachers and staff to try and prevent any kind of political activism. “It is so important during these times that we talk with our students about how a walkout is not necessary and that we are all working together to optimize school safety,” said Rosanne Richards, an official from CCSD, in a message sent to principals across the district. Very quickly students were taken aback by the harsh and demeaning tone from the message and many students are starting to second guess participating in lue of CCSD’s stern stance on discipling those who do. Not only is CCSD’s message of trying to punish those with a passion to save their lives and their friends wrong, but it should serve as motivation, not fear, to the thousands of students across the district who want to make a change. Saying that a walkout is “not necessary” is degrading to those who want to protest and a flat out lie. For years, America has been the center for political activism and a place for every voice to be heard. It led to the Civil Right Movements, women’s right to vote, and so much more. This fear tactic used by our district shows the exact opposite of their claim: a walkout is more than necessary at this time, and the district should not try to take such a right away. Since Columbine in 1999, over ten thousand students have been apart of mass shootings, over a hundred kids have died, and countless lives have been altered and changed in a way that cannot be undone. To tell these young adults and kids affected by these crimes that a little talk is the answer to their fear of dying in what should be the safest place for them is ludacris. These past years have shown that there is danger every time we leave the house, whether we’re going to school, church, a festival, or even the store. We live in troubled times, and to say that trying to make a difference to better our own lifes is “unnecessary” is a horrible thing to teach to kids who already go to a district that is as far from reality as it is. Telling young minds that protesting their beliefs isn’t needed is dangerous. This will only corrupts our youth more than we already have with false ideas of how change is to come. As adults, change does not come from sitting silent, it comes from activism and letting your voice be heard, despite all who oppose you. It is our constitutional right, not our privilege, but our right, to peacefully protest and have freedom of speech and expression. As much as CCSD thinks that their students are too young to speak their minds and make a difference, we are the ones that are being affected. Our teachers are the ones risking their lives for students; the suits and ties in office buildings are not the ones that fear for their lives after these events. To them, we are seen as the next lawsuit and next chunk of change they don’t have, not as humans and young kids who are in danger everyday. They have no control over who comes into our schools and what will happen, they can not enforce background checks on gun owners, they can not add legislation to increase security checks and add mental health checks to gun buyers, they can not influence congress by adding another CCSD police officer to each school: we are the only ones that can change the world. Not a single change in our history was caused by those who are payed outrageous salaries sitting around and sending messages to those wanting a change. When we stopped the oppression and discrimination of African Americans, we didn’t sit at home and wait for it to happen; we took to the streets and took on the danger with pride, when we stopped segregating schools we didn’t flinch at the racists yelling and throwing items at young children, we pushed on knowing what’s right. Americans have marched knowing that dogs, water hoses, and other forms of torment would be used to deter them, but we marched on. When we stopped denying women their right to vote, we didn’t let congress just pass it when they felt like it, we took to the streets and marched for days until we got the change we demanded. Apathy and letting the people who don’t care about anything about us besides our tax dollars try and control us will only lead to more innocent deaths. Stand with me and the thousand other students over the nation that want a change, do not let CCSD’s threats deter you from the right for us to go to a safe school. It is our constitutional right to voice our opinions and demand change: no one can take that away from us. I absolutely LOVE this story and can’t agree with the message more. I have a child in middle school and they are giving us a really hard time about wanting to participate in the walkout. Your story reminds all of us why we need to be strong and support the victims. Thank you for this story! FANTASTIC!! I’m sure your parents must be proud of you and I have a feeling I’ll be voting for you some day 🙂 Keep up the good work. Your generation is our next leaders and you are heading in the right direction!! You do have support-its just that the negative garbage gets more press 🙁 YOU ARE DOING THE RIGHT THING–KEEP IT UP! !